Sturdy and stable, the Yonex Lumio shoes will be a comfortable option for recreational players. The synthetic upper offers breathability and a good amount of support as the lacing system allows you to cinch up the shoe and feel complete comfort. The midsole in Yonex Lumio All Court shoes offers cushioning and shock absorption while the unique tread pattern will provide traction and durability on any court surface. Round Sole - The YONEX Round Sole ™ is designed to provide all-around support for quick and smooth footwork. The Round Sole ensures smooth movements and the transfer of maximum energy. 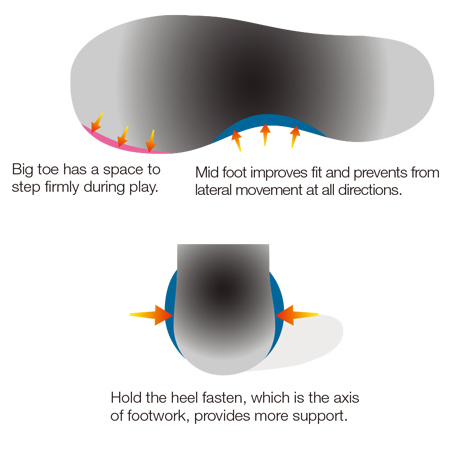 Toe Assist Shape - A toe-centric design that cuts down on the pressure in the big toe, as well as offering improved support at the mid-foot and heel for a stable fit. Power loss is reduced, allowing for swift footwork.